Who should we keep? Who’s a possible to keep? Who should go? If rumour is correct, releasing Boyd, Pudil, Jones and Abdi will remove a sizeable wedge of cash from our outgoings. Of the ones we own, keep Westwood and Palmer. It’ll be interesting to see who we get rid of in the summer, and to see where they end up. I think a good percentage of those released will end up at Lower end championship clubs/ maybe even league one due to their ages and injury woes. Someone said on a different thread we are too sentimental as a fan base, a case in point would be Kieran Lee who has been great for the club, but will he ever replicate the form of two/three seasons ago? I really hope that Bruce will take a realistic view of who he wants to keep for next season and be quite ruthless with the crocks that frequent the treatment room. More pace, more bite more urgency required in all departments. or in 'other words' is it none of coco's or dc's signings? Of our own players, it's Westwood, Palmer and Hooper, the others either for their age or injury records have to go, I'm a big Lee fan but recent injury problems and not getting any younger?,same with the 2 Newcastle lads, we can't afford to have players who you can only get 20 odd games a season out of Hector would be good to keep at the right price and we must also try to offload some contract players, Winnall, Dawson, even Reach if the right offer came in, he's too lightweight for me personally. Keep Westwood and Palmer. And Hector if is a possible loan again. My heart wants to see Lee stay cos he's just my favourite player since waddle. Absolutely adore him. But the head says he'll never be back like he was so stupid to keep him. Big Dave is a keep for me, he gives us something different, when you're chasing a game and need to go more direct or hold the ball upfront he's your man. Not giving up on Lee, hopefully he can be involved before the season ends. Westwood is a necessity and a no brainer and Palmer deserves his new contract. Abdi, Jones, Boyd, Matias and Pudil should all be released. Hooper and Lee - I’ll leave this with Bruce. We absolutely need to re-sign Hector - this has got to be our number 1 priority. I like the look of Aarons and Lazaar but again im worried about their injury record. Brucey has got a massive job on this summer. We also need to sell a load that are out of favour. This is much easier said than done. He has another year left. Lee is a tough decision. He has done right by us over the years when he was courted by Prem clubs (were the rumours Everton and Wigan?) so maybe we should do the right thing by him? They say there should be no sentiment in football but I would say there are genuine exceptions and Lee is that me of those. If Westwood is willing to take a BIG wage drop, then I'm sure Bruce will want him here next season. He's still got a couple of years left at least, and he's proven his worth (and fitness) in the last 3/4 months. It'll be down to Westwood himself. Will be seek a more lucrative contract elsewhere? With regards Hooper, very much dependant on the next 4 games. If he plays in all those games, and shows no signs of breaking down again, like Westwood, I'm sure Bruce will be keen for him to stay. But, again, he'll have to accept a big wage drop, and perhaps a shorter deal than he may get elsewhere. I personally think, there's more chance of Hooper leaving, than there is him staying. We'll see. Out of everyone else who's out of contract, the only other one I think may be here next season is Boyd. Bruce likes him, trusts him, plays him. Again, he'd need to accept hugely reduced sums, but if he's willing to take that cut, Bruce might see him as a good squad option for next season. With regards the loanees, it's out of our hands really. I'd be interested in bringing back Hector, Lazaar and Aarons, but it very much depends on the fees Chelsea and Newcastle would want. My instinct is, I think we'll be priced out of all three of them. Hector, in particular, will be a huge void to fill. He's been our Player of the Season by a country mile. Try and sign Hector, Arrons and Lazzar on season long loans. Sometimes you need to see who will sign from elsewhere, before you make a decision to resign the ones on the borderline. AND will we be on an embargo? Peopke saying release Abdi cos he's a Croc yet wanting to sign Lazaar who's like Francis Jeffers of the modern game. 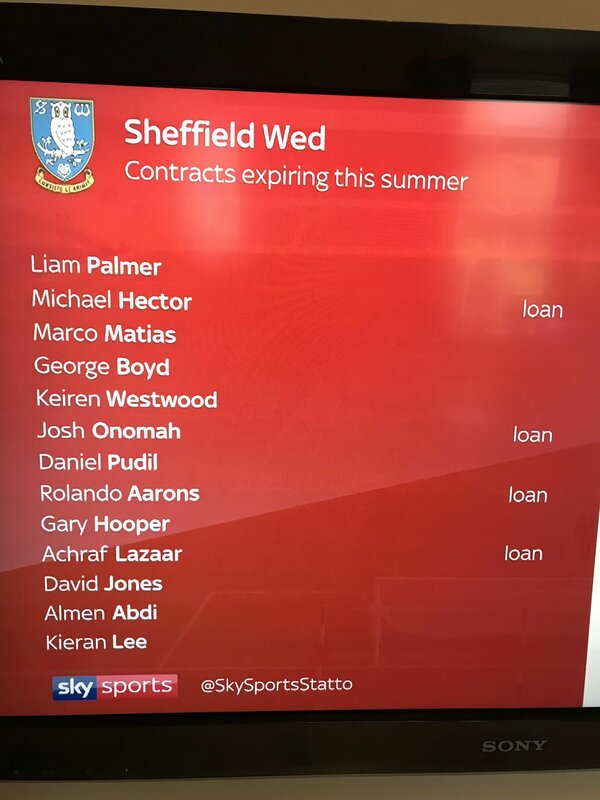 I'd keep Westwood and loan/sign Hector if funds allow. The rest can go for me.